Join us for another night of socializing/networking events for the LGBTQ+ Community and our Allies! For the month of April we are excited to be at The Broad Axe in downtown Hagerstown. Join us for a fun and relaxing evening for socializing and making new friends! 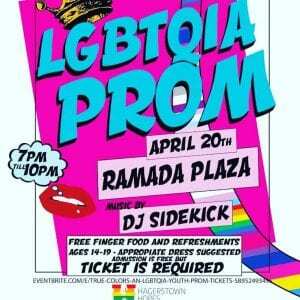 Come as you are to the LGBTQIA Youth Prom in the Ramada Plaza Ballroom! All identities ages 14-19 are invited to dance your heart out and be prideful of who you are! Tickets are free, but required. Grab yours here! Join us for another night of socializing/networking events for the LGBTQ+ Community and our Allies! For the month of June we are excited to be back at the Gourmet Goat for our 2019 Pride Kickoff Event!!! Join us for a fun night of socializing, making new friends, and celebrating Pride! 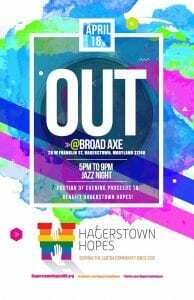 As we develop and finalize plans for Hagerstown Pride 2019, we will be updating this page to bring you the most up to date and accurate information. 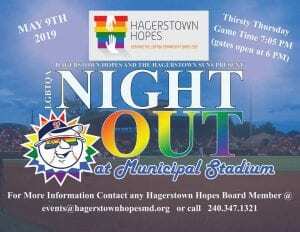 If you have any specific questions, please feel free to reach out to us via e-mail at events@hagerstownhopesmd.org with a subject of "Hagerstown Pride 2019"